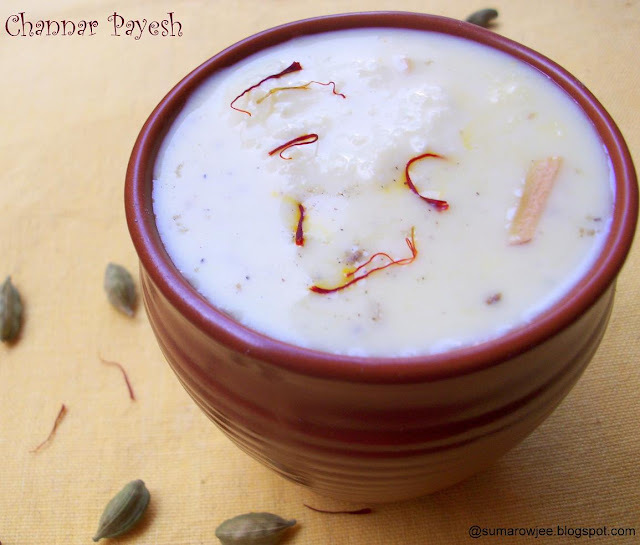 Channar Payesh - Cottage Cheese Pudding - For Secret Recipe Club! The Secret Recipe Club - Doesn't this sounds quite mysterious? If you haven't heard of this famous group yet, its the brain-child of Amanda of Amanda's Cooking. This began with Amanda and her friend cooking from each other's blogs for fun, but then thought, the more the merrier! Thus was formed a group of food bloggers who would cook from each other's blogs every month, but shhhh! its a secret whose blog you will be cooking from! Each member of the group is given a blog to cook/bake from, and a reveal date is set for each of the 4 groups. Members blog about the recipes on the reveal date and only then you know who has cooked or baked from your blog! Each month a different blog to cook from, and as Amanda says, indeed a fun way to discover new blogs. Click here to join the club. 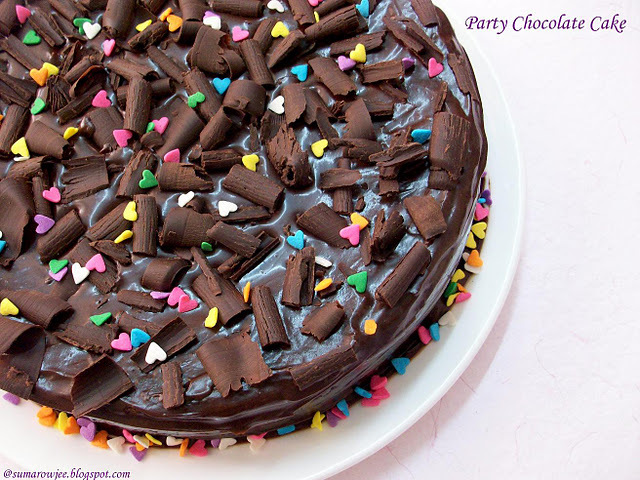 I was assigned the blog Chocolates And Dreams by Rituparna, the girl who was pushed into the kitchen by her mother, now A Daring Baker, way to go! As I browsed through her blog, the Croissants , Baklava, Chocolate Olive Oil Cake beckoned me. Much as I would have loved to try these awesome recipes and some more other recipes, I was pressed for time and zeroed in on the quick and delectable Channar Payesh or Cottage Cheese Pudding. With a taste and texture similar to rabdi or basundi (but much softer), this is a familiar sweet dish you can find at most Bengali sweet shops, one dessert I love to eat! Channar or paneer is cottage cheese as we know, and this pudding is simply thickened, sweetened milk simmered with cottage cheese. Add saffron or cardamom or kewra water and nuts as you please and chill. There you get one of the most delicious of easy desserts! You could use grated store bought paneer or fresh home-made paneer or cubed cottage cheese as Rituparna does. I have used crumbled home-made fresh paneer as I love the soft texture it brings. Much as I would like to have it the other way, full fat milk or whole milk elevates this dish to a different level. So, full fat milk and home made channar (with full fat milk, help!!) it has to be! If the calories are your concern make half the portion (which you will regret later) or even simpler, just invite me over and you will not have any left-overs! Procedure : In a heavy bottomed pan, bring one liter milk to a boil. 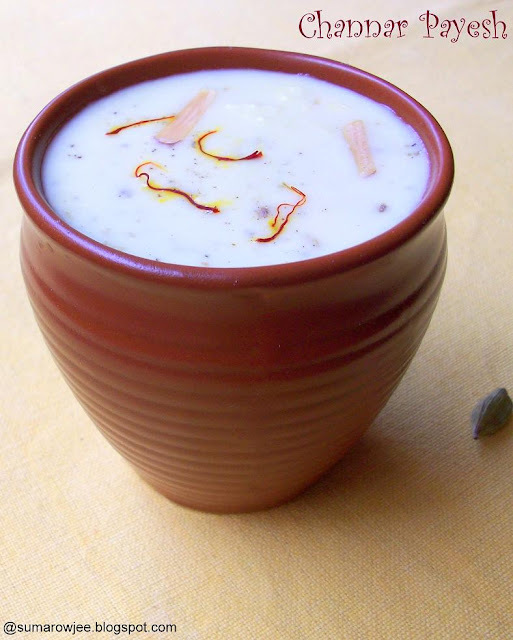 Reduce the heat to low, add the saffron if using and keep boiling with a ladle in the milk to avoid boiling over. Suspend a fine meshed strainer over another bowl. In another heavy pan, heat the remaining one liter of milk. When it comes to a boil, reduce the heat to low, add the lemon juice. Boil for 2-3 minutes (approximately, I forgot to time), the milk will separate and you can see the whey and the milk solids. When you see no more milkiness and only the yellowish whey and solids, turn off the heat. Strain immediately. Do not boil the channar or leave it sitting in the hot whey for longer as it may turn rubbery. Once you strain, pour some cool water over it, 'washing' it 3-4 times. Rinse the channar as you do so, this will help remove any hint of lemon from it. Allow the excess water to drain away in the strainer (about 30-45 minutes). Crumble the channar lightly with your fingers so that there aren't any large chunks of cottage cheese. Now back to the simmering milk. Let the milk reduce to half the original quantity, till thick and creamy, this will take 30-45 minutes for this quantity depending on the heat you are giving. Add the sugar, stir to dissolve. Add the channar, boil for 3-4 minutes (not much longer), turn off the heat. Add the crushed cardamom. Cool completely and chill. The pudding gets thicker as it chills, so you may need to add some more milk to adjust the consistency. 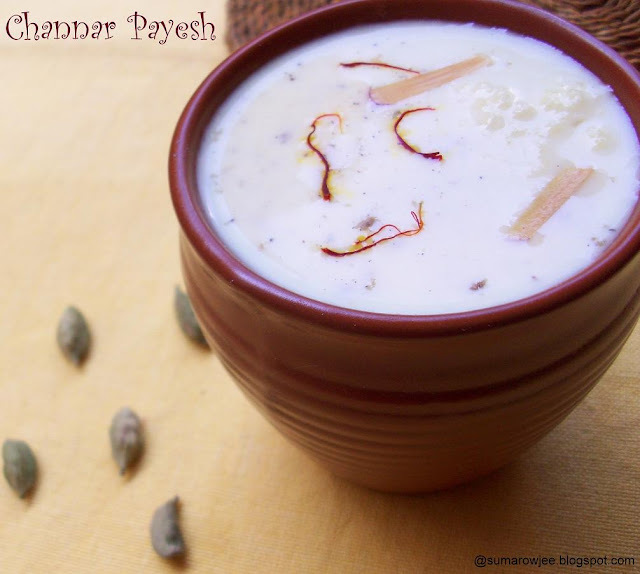 Garnish the chilled payesh with nuts and serve. Please note : You could use sweetened condensed milk to thicken it, in which case you don't need to add the sugar. But I personally find it too sweet, hence avoid using it. Thanks Amanda, had fun doing this! A collective 'Gro..oan'!!! I heard it! I heard it! Considering that I gave you an over-doze of cookies last month, I am not very surprised to hear groans from you on seeing cookies here again! 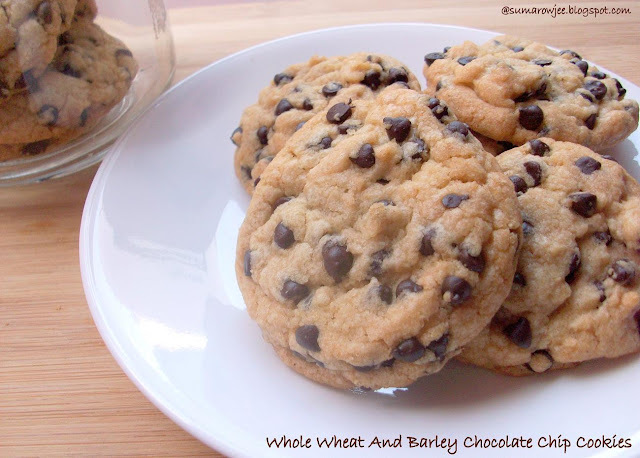 But then I guess, it would be hard to say 'No' to chocolate chip cookies which are crunchy and light, made with whole wheat and barley, less butter, some oil and no plain flour at all, making it a 100% whole grain cookie. 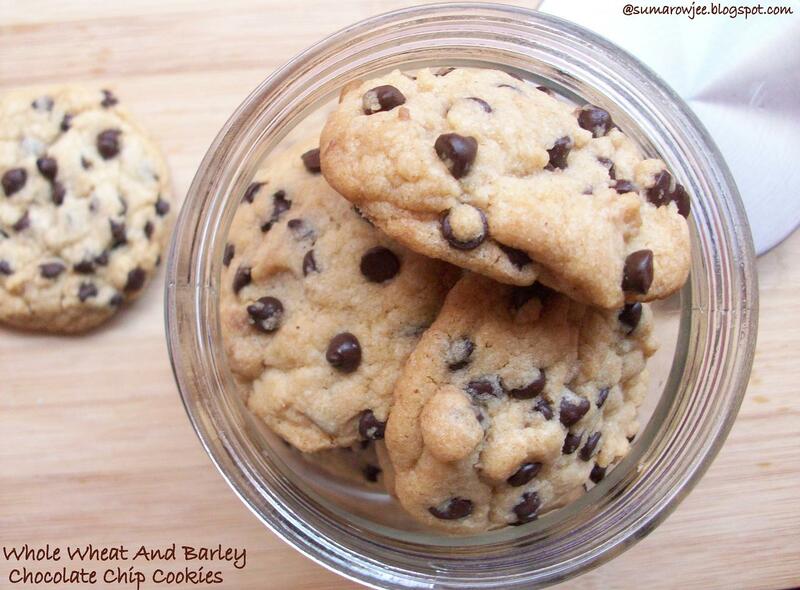 Relatively healthy, but still delicious cookies you may want to fill your cookie jar with. And not feel very bad or guilty when your kids happily snack on them. 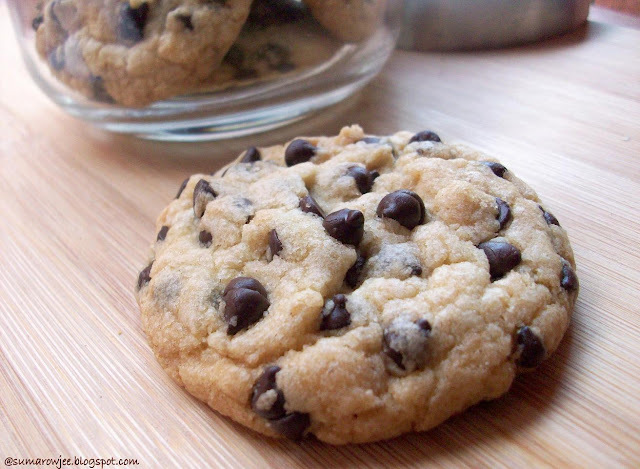 Is there ever a time when there is no demand for chocolate chip cookies warm out of the oven? Not at my home, am sure, neither in yours! Strange as it may seem I don't enjoy my bakes very buttery, chocolate chip cookies included. Some amount of buttery-ness is welcome though. So when I came across this recipe in one of my bed-time reading books, which happens to be the King Arthur Whole Grain baking book a good number of times, I had to try it of course. A pantry which does not stock on whole wheat flour is so very rare in this country. But barley is one grain, I never bothered to buy till I got the KAF book. Its rich in soluble fiber and minerals and brings along a host of other nutritional benefits with it. I have used it earlier in Graham Crackers and the flour certainly delivers the crunch factor as the book promises. Since I have not come across barley flour in our supermarkets here, I get a small quantity of barley milled and store it at home. You could get whole barley at most super-markets, failing which you can surely find it at your neighborhood wholesale rice trading shop. 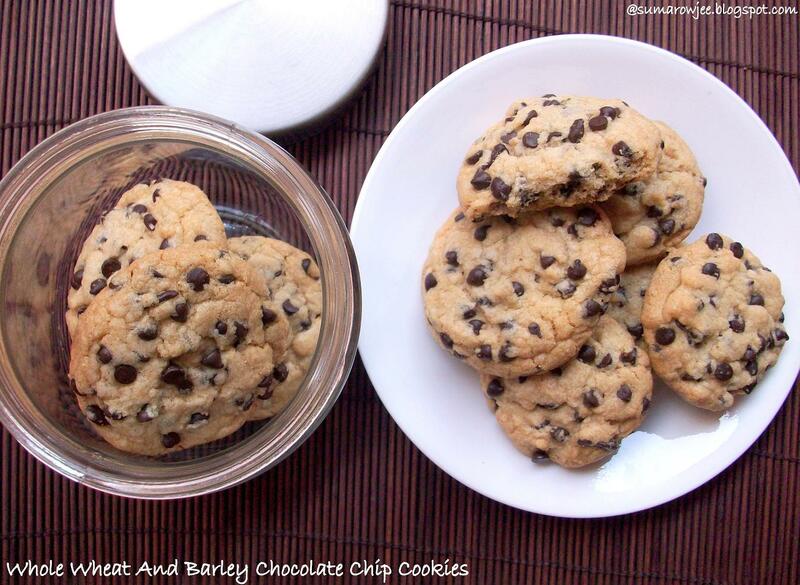 The original recipe in the book uses a combination of brown and white sugars and a lot more chocolate chips. I have baked these cookies a few times and below is the version which I liked best, taste and flavor-wise. I have used only white sugar instead of a combination of both brown and white sugars, reduced the sugar and chocolate chips, omitted the espresso. Since the regular granulated sugar we get here does not dissolve easily (specially if the butter and oil in the recipe is less), I have powdered it and then used. You could alternatively use good quality caster sugar. Please find the original recipe proportions in the note below. I have halved the original recipe to give me about 20 medium sized cookies, which is a good enough quantity to bake in the sizes of ovens most of us bake in. Please feel free to double it if you wish. I prefer weighing the ingredients, flour, butter and egg (since I have used half an egg here) for best results. White sugar - 1/2 cup, measured and powdered. Please note : The original recipe uses 6 tablespoons of brown sugar and 6 tablespoons of white sugar each (making a total of 12 tablespoons for the recipe of the proportions above) I have reduced it to 8 tablespoons ,i.e, 1/2 cup. The recipe has 1 1/3 cups of chocolate chips (the above pictures were taken earlier) by the and 1/4 teaspoon espresso added too. The amount of sugar I used was just right for me as the chocolate chips add to the sweetness of the cookies. You could also use chopped bits of dark chocolate in place of the chips or use a combination of lightly toasted walnuts and chocolate chips / chunks. I liked the texture of the cookies when the dough was flattened and baked rather than rounded tablespoonfuls of dough baked for a couple of minutes more. The above pictures are of the cookies from the earlier attempt. They will be slightly flatter and have less chocolate chips if you go by the recipe above. You could try using flax-egg or use cornstarch to substitute the egg here, it should work fine. Use 1 tablespoon cornstarch plus 1 tablespoon warm water whisked together to replace half an egg. Mix 1/2 tablespoon flax meal with 1 1/2 tablespoon warm water, let it sit for 5 minutes. Use the mixture to substitute half an egg. Please refer Champa's post here for more details. Custard and its various delicious incarnations - I am just opening my eyes to them! Creme Anglaise or home made custard sauce was super delicious, tempting me to try more of its variations, Pots De Creme one among them. 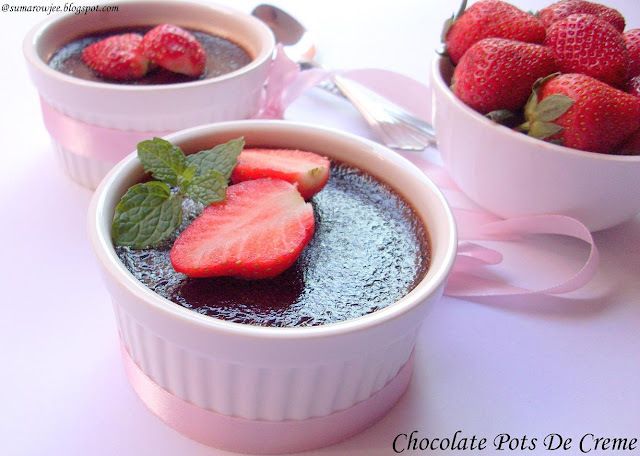 Deeba's gorgeous Pots de Creme made me sigh, made me wish I could have really tasted it, made me forget my resolve to not eat desserts (just for a while;) and then finally before I knew it, I was reaching out for the packet of cream and chopping the chocolate. Chocolate is temptation enough as is and when chocolate is 'smooth, silky and deep mousse-like' as she describes it, its more so. Aah, the lure of desserts which need so little effort and hands on time, how can I love chocolate and not give in ? Pots De Creme (pronounced as Po de Krehm) is also called as pot-au-creme, French for Pots of Cream. 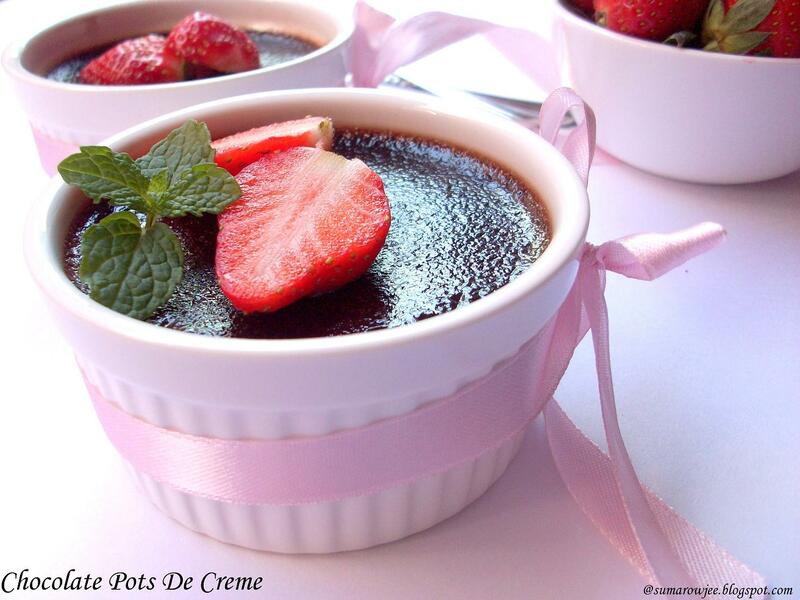 As Deeba mentions, Pots De Creme, refers to the little desserts as well as the little lidded pots these are served in. Essentially baked custards, these are made by heating milk, heavy cream or half and half and sugar, then added to vanilla, coffee, caramel or chocolate (most commonly) or other flavors. The hot mixture is gradually whisked into egg yolks and sugar, then strained and poured into the baking dishes. Straining is an important step here as it helps remove any bits of uncooked egg, giving the custard a smoother texture. The custard is baked in a bain-marie or water bath. The water bath helps the custard cook slowly and evenly with indirect heat and also offers protection against curdling. Information complied from Potsdecreme. Adapted from Passionate About Baking, originally from Cannelle et Vanille. Deeba uses cherries and Aran uses raspberries in the desserts, I have made them plain. Assemble a large, heavy saucepan with a handle, a ladle of about 1/4 cup capacity, 3 large bowls, plus another large bowl with a wide base, a large fine meshed strainer, a couple of spoons, a whisk, a spatula. You will need 6-8 (sorry, forgot how many this filled) small 120 ml capacity ramekins or oven proof bowls. If using ramekins of different capacity the baking time will vary. Small portions are better. Suspend the strainer over one of the large bowls (You should be able to easily pour the custard from this bowl into the ramekins). We need a baking tin which will fit the ramekins without crowding them in, but not too much empty space otherwise. This is particularly important if baking in a convection microwave as your ramekins will swim in the water as the turntable rotates. Place a small kitchen towel to cover the bottom of the tin, then place the ramekins in the baking tin. I needed to use two tins, one 8'' square another smaller one. Have some very hot water on sim on your stove, better more than less. A tea kettle will be perfect! The water has to later come halfway up the ramekins when you keep them in the baking tin. Have on hand a pair of mittens or thick kitchen towels. Helps to have your microwave or OTG at a comfortable level as its dangerous to lift up the tin with the hot water. 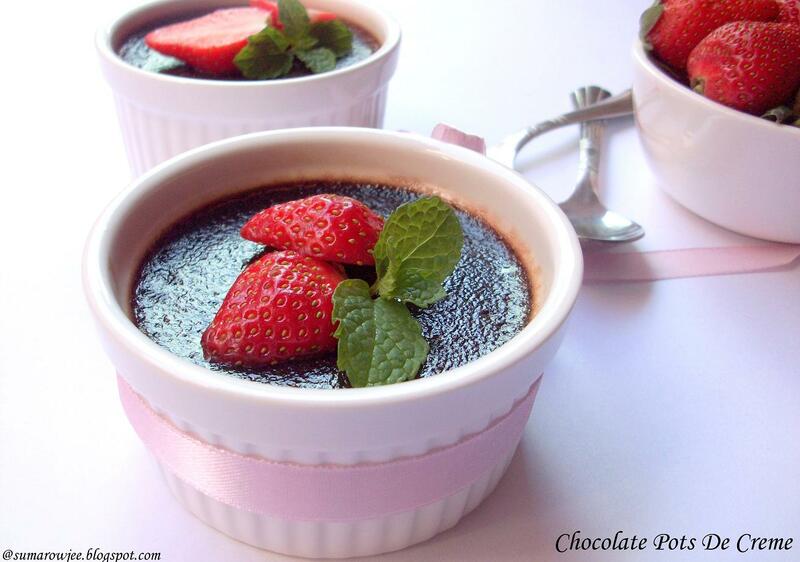 Preheat oven to 160 degrees C / 320 degrees F.
Place the chopped chocolate in one bowl. In the wide based bowl, whisk the egg yolks and half of the sugar. Set aside (do not leave it sitting for too long as a film will develop over the yolks). In the saucepan, bring the milk, the cream, vanilla bean and other half of the sugar to a boil. Pour this over the chopped chocolate and stir until the chocolate is completely melted. If by the time the chocolate melts completely, the mixture cools slightly, heat it again carefully. Using the ladle, very gradually and slowly, whisking constantly, dribble the hot chocolate mixture into the egg yolks. Dribble all of it gradually. If you rush this process the eggs will curdle. Strain the custard through the strainer into a bowl. Pour the custard into the ramekins just a little below the rim. The custard doesn't rise, it just sets as it bakes. Taking care not to splash the water into the ramekins, carefully pour the hot water in the baking tin so that it comes halfway up the sides of the ramekins. (You could first place the baking tin the oven and then pour the hot water, but this is not possible in my small oven or even the microwave, the rack may tilt in the process). Open the oven door (If baking for the Valentine, have him stick around and hope he will be chivalrous enough to open at least the oven door for you!) Now place the tray carefully in the oven. Bake the custard in the water bath for about 25-30 minutes or until the center appears set, but jiggly when you gently shake the ramekins. The baking time depends on the size of your ramekins and your oven, so watch carefully from 20 minutes onwards. Do not over bake or your custard may turn rubbery. Err on the side of under baking as the custard will set further on refrigeration. I normally remove the ramekins from the water bath soon after as I am scared it will continue to cook in the hot water. 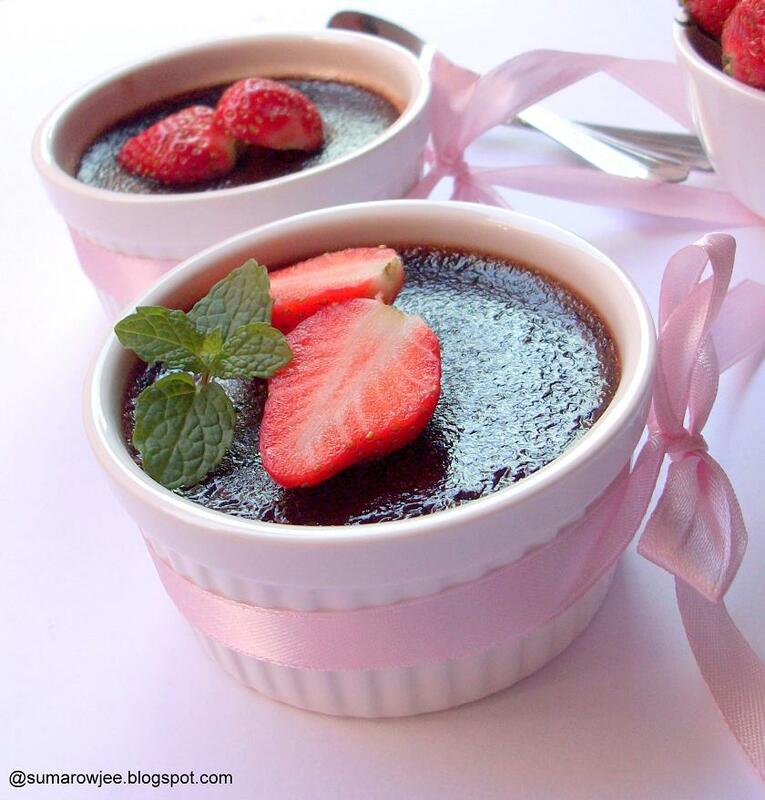 Cool the custards to room temperature, cover with plastic wrap and refrigerate overnight for best results. I must mention, I don't like these warm! The chocolate flavor is more intense on chilling. Chill for at least 3-4 hours or even better overnight or even a day! This will allow the custard to set well and allow the flavors to mature. Please note : The baking time is very important for the best texture of the custards. The custard may appear to need more baking (but it should not be liquid or gooey) if you spoon out some when warm, but it will set well on refrigeration. So slight under-baking is better than over-baking. If baking in a very small OTG (not microwave) there is a risk of uneven baking, a convection microwave works better here as your tin rotates while baking. We loved the custard chilled, it was indeed really good! Hubby loved it, son ate it very slowly, savoring every quarter spoonful (can't let it get over too soon!) that went into his mouth till the bowl was squeaky clean. He even proudly showed it to me, saying there was no real need to wash the ramekin! Yes, its real rich, delicious chocolatey smoothness. Thanks to Deeba, I have another keeper of a chocolaty recipe, one I shall be making again and again. Please note: I have used 85 grams of yolk as given in the original recipe. I would not skimp on the yolks, and no there was no eggy smell. Use whole milk and not skimmed or low fat, it does help to get a good consistency. Do strain the custard to get a really smooth custard. Now, if you have all the ingredients on hand, you really do not have an excuse to not bake these right away and treat your Valentine to some chocolate indulgence today. Storage space constraints just don't matter when I buy new baking pans or blog props. God forbid, you may see me limping tomorrow as one of these may fall on my foot - either from the overcrowded rack in the tiny dining room or from my overflowing wardrobe where I stash away some precious jumbo sized bake-ware. I guess some may be of no use to me currently, but am sure I will find it extremely useful ... may be 3 years down the line? Oh yeah, talking of props, those delicate dessert glasses are more for my pictures. Once I am done with the pictures and we eat out of them, any leftover desert the next day can be eaten out of the sturdy melamine bowls which can actually be tossed into the sink! My son mentioned he needed a plain white T-shirt for his school day, and I made sure he got it... after dragging the reluctant kid to may be just half a dozen shops for that perfect white shirt - he needs it you see. And may be it will also make a nice background for that ice cream in a cone shot, no? Love it when folk visit us. A chance to bake something - for a new post! That cake which I want to post, but the pictures are not quite nice. Bake it again, take the pictures, quick! hide any signs of 'shooting' before the guests arrive. But save the presentation and serve it to them like I that's how I eat food everyday! I was never interested in gardening - or may be I should admit, my only serious interest till date has been food. But I never find these fresh Italian herbs when I need them - so I grow them! Apart from oregano, basil, thyme and sage, and yeah, mint, coriander and red chillies make a great garnish, so I got to grow them all. Oh yes, I would have grown strawberries and oranges too, but I guess they don't grow all that well in a pot? I plan and plan for that birthday cake for hubby and kids, as I want to bake it for them of course ( please don't hurt my feelings by even thinking otherwise!). Guess it would also double up as a nice post for the blog anniversary or Valentine's Day or some such thing ? Just twice in my 2 years of blogging, I was so engrossed with hubby's birthday cake, I almost forgot to cook him a nice birthday lunch.. almost! - believe me. And when I am supposed to be happily singing the birthday song while hubby, son or daughter cut the cake (latest before 5.p.m before the sun goes down, we conspire for things to work like that ;-) ), I am more worried about how the cake will be cut. The first slice needs to pose for the pictures (a 15 minute break please) before its eaten...All food, freshly baked and cooked, will be eaten only once it gets photographed and cold . Patience is a virtue - which I enforce on hubby and kids - for my convenience, and my blog! Christmas fruit cakes - I made about 4, all different recipes of course, (picture me indignant looking) in a week. I had to get the recipe which made me happy. By the time, the 4th one was baked, hubby and kids did not want to touch candied peel or fruit with a barge-pole or smell cinnamon and cloves baking for the next 6 months. Poor things, for all that trouble, power cut ruined the best cake and blogger could not post it on Christmas Day...sigh!! I have more pictures of food on my computer than of my own kids. Forgive me kids - I don't even qualify for applying to be the best mother around. From the time I was in school, I never was one to show any bit of interest in art and craft. I filled up one entire 6'' square cloth with cross stitches, chain stitches, crochet of that vague resemblance of a flower...all over a period of one year, in that dreaded work experience class. Forgive me Sister Susan. I can still see that disapproval in your nod for the pathetic art and craft student. I hope you will be happy if you know that today, I am really interested in something which vaguely fits this category. chocolate borders, candied roses with orange peel, painting cartoon characters, heck I even made Practice 'Buttercream' - just to learn how to pipe those borders neatly. Being unable to attach a picture on the blog is a matter of emergency. Hubby is my tech support helpline, no down time please! My small expectations - he can request the airlines to delay the flight take off by about 10 minutes, before he flies to Dubai for that meeting to discuss software and other uninteresting things. Gosh, the internet is down and I need to recheck that recipe, he could quickly read it out to me? I promise I won't stop him from getting back on that con call with the waiting client soon after! The friendly neighbor with the very pretty, immaculately manicured hands could please hold a basket of strawberries for my pictures...maybe a score or more till the non-photographer finally gets it right...Hey, hang on, I will just transfer them to the computer and check, in case I need to, could we redo? I concede that being spouse/child/neighbor of a food blogger is not always easy, but hopefully not so bad either? All said and done, what's life if you are not passionate about something? It does make life a bit crazy at times, drives folk around you crazy...but would we have it any other way? Wash and drain the herbs in a colander. Shake off excess water, remove from the colander, shake off any more excess water. Wipe dry with a kitchen towel. Pick out the very thick stems. 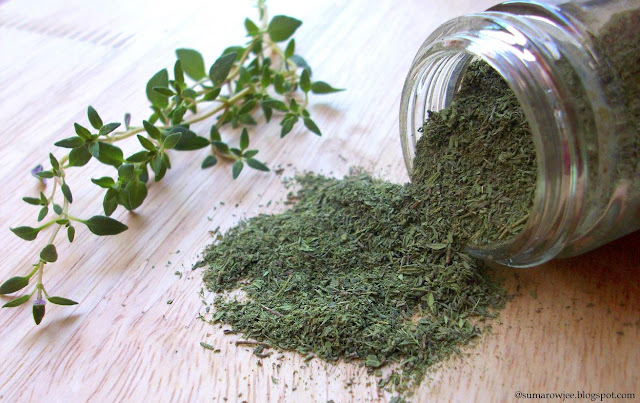 Spread the thyme on a microwave safe plate in a single layer. Microwave on high power for a minute. Mix the herbs, microwave again for 2 more minutes, redistributing the herbs once after a minute. The herbs will feel fairly dry by now. 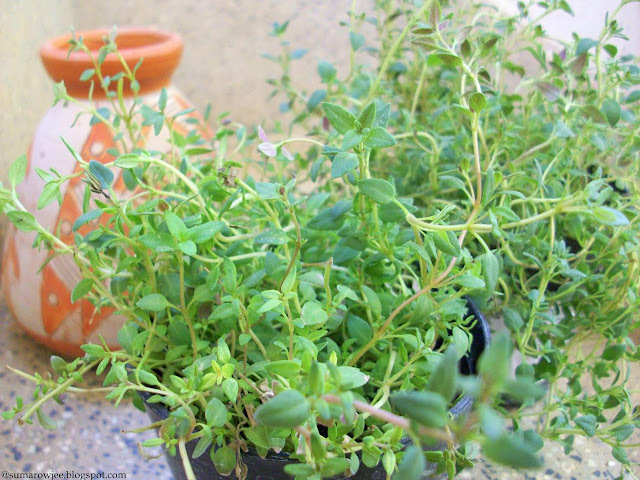 If your herbs are wet, it may take another minute for them to feel dry. Microwave 3-4 times on high power for 30 seconds, redistributing them once after every 30 seconds. Once the herbs are almost completely dry, remove the plate from the oven. The herbs will dry and crisp further as they cool. Once completely dry and almost crisp, crush them between your palms or grind in the smallest jar of your mixer. Store in an airtight container. I store mine in the refrigerator. Please note: The microwaving time may vary depending on the quantity of the herbs you microwave at a time and the power of your microwave. Do experiment with what works for you best. Be careful not to overdo the microwaving, avoid microwaving the herbs for long periods at a stretch as this may cause the herbs to burn. Just between you and me, do you have any confessions of yours to tell me? My first ever guest post - for Divya Kudua! She needs no introduction, she is an inspiration for the reluctant chefs. I was all too happy to guest post for her, one of my sweetest blogger pals. 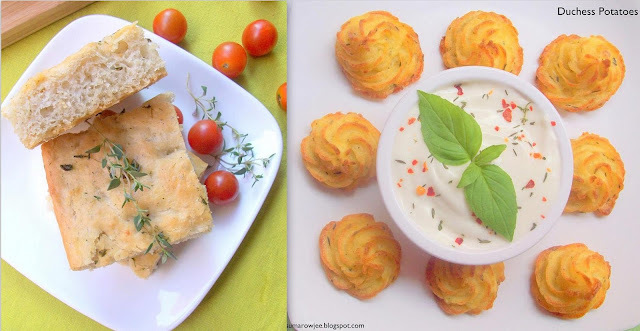 I am honored to be putting up my post on Easycooking, her very well known space in the blogosphere. One recipe, so many variations! Breads do let you have your way with them, giving the baker a whole lot of freedom and flexibility with flavors, proofing time and techniques. The smell of freshly baked bread wafting in your home is something truly amazing and very addictive. What you can bake at home is something you will never find in a bakery, the satisfaction - paramount! 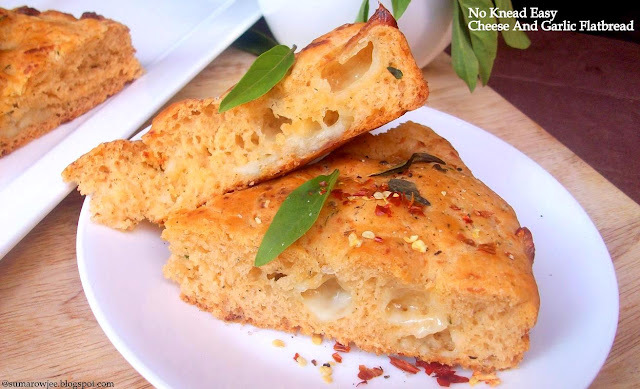 All the more reasons, why you must absolutely bake breads if you have not started yet. Sorry cakes, cookies and co if I am shifting loyalties (just a bit! ), but I am smitten by yeast! If you are new to baking breads, do read the below posts for better success rates!.